PARK LEK II: A UTOPIAN ART PROJECT AND A CONCRETE INTERVENTION IN THE URBAN PLANNING PROCESS. As part of its 2010 inaugural exhibition, Marabouparken Konsthall invited the artist Kerstin Bergendal to create a project with park play as its inspiration and point of departure. The project PARK LEK (PARK PLAY) brought together civil servants and politicians from the Municipality of Sundbyberg at the art gallery in order to reflect on how the city’s parks could function as contact areas for the citizens. The discussions touched on the planned densification of the districts of Hallonbergen and Ör as a concrete example of how urban development is slowly encroaching on parks and green areas. A full year later, the PARK LEK project entered its second phase, this time with focus on the urban development in Hallonbergen and Ör. 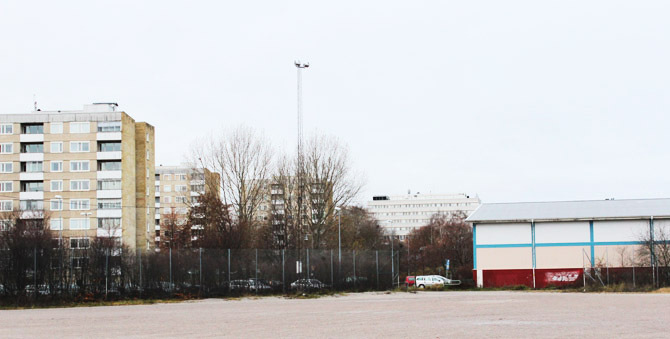 Kerstin Bergendal was commissioned by the Municipality of Sundbyberg to continue the discussions – in collaboration with the National Public Art Council Sweden and Marabouparken Konsthall – with the residents and other local actors in the two districts. She is currently working with them to chart thoughts, ideas and structures they perceive in their areas today. The goal is to incorporate the local perspective in the council’s plans for Hallonbergen and Ör and thereby supplement and perhaps amend the densification proposal of December 2011. PARK LEK II is thus a utopian art project as well as a concrete intervention in the urban planning process. During the past few months, Kerstin Bergendal has spoken to some 120 people who live in or are otherwise associated with Hallonbergen and Ör. In addition to residents, the artist has met with the police, local associations, property owners, politicians, civil servants, library staff and shopkeepers. By means of these personal conversations, the artist has attempted to capture the subjective feeling for the city, the personal experience of living or working in the areas and the interpersonal relationships that characterise the everyday life. Each conversation has been documented by video and photography. The discussions have touched upon such disparate subjects as the contentious issue of the selling of council houses in Ör, improvements made to the Hallonbergen Centrum, how the closure of the school in Hallonbergen affected the children and if, for example, allotments could counteract segregation. Workshops for an alternative plan! The conversations have had an open format, allowing for dreams and discussions of utopian proposals. In the next phase, the wealth of suggestions was concretised and during two workshops at Kulturcentrum in Hallonbergen, on 24–25 March and 31 March–1 April, all the participants were provided with the opportunity to meet and discuss their views with one other. 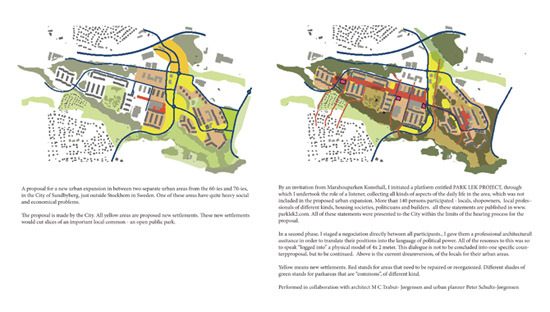 On hand were professional architects, landscape architects and planners who could help to coordinate, qualify and compile the ideas into a parallel, resident-steered programme for the future of Hallonbergen and Ör. In an additional three workshops with local institutions, PARK LEK II will focus on the lack of cooperation between local actors. After the workshops, Kerstin Bergendal “translated” all the conversations and ideas into a model and an alternative programme for Hallonbergen and Ör. The model, which initially was a landscape model of the area, was, during the course of the process, transform into a hybrid of the residents’ dreams and the concrete reality. The model was used as the basis for a discussion that took place in a workshop for politicians, property developers and civil servants on 22–23 May at Marabouparken Konsthall. The workshop provided the decision makers with the possibility to take on board the local actors’ thoughts about Hallonbergen and Ör by processing the residents’ ideas. The process of densification is underway, but is not yet finalised. PARK LEK II operates in the gap between the concrete and the utopian and challenges the professional planners to develop other ways of collaborating in the shaping of public environments. Click on the image to view a bigger version. This unconventional exhibition will be the final instalment in the long process that has been PARK LEK II. Its design and content will relate to the role of discussions in the project. In the exhibition, Kerstin Bergendal will present films and photographs from her discussions with the residents and their working days in the area. The model, which has been developed during the project, will have a central position in the exhibition. The council’s decision makers will be given time and space in the exhibition to communicate their decision on the future of the two districts in a large inclusive discussion on 31 August, which will replace the traditional opening. To underline that PARK LEK II is a process that is dependent on the participation of several different actors, the exhibition and the accompanying programme of events will be designed as a potpourri of contributions about and by these participants. A local male choir will sing, studio portraits of the district’s residents taken by Hallonbergen Centrum’s local photographer will be displayed together with models of steam ships and a collection of images of racehorses owned by some of the residents. This part of the exhibition will highlight a more multifaceted image of Hallonbergen and Ör, focusing on the interests and artistic practices of the residents. PARK LEK II is part of the research assignment “Samverkan om gestaltning av offentliga miljöer” (Collaboration on the Shaping of Public Environments) led by the National Public Art Council Sweden, the Swedish National Heritage Board, the Swedish National Board of Housing, Building and Planning and the Swedish Museum of Architecture (for more information, www.statenskonstrad.se). The Municipality of Sundbyberg collaborates with Marabouparken Lab. in the realisation of the project as a way of deepening the dialogue with citizens and regards PARK LEK II as a manner of developing a method. Marabouparken Lab. is one of the initiators of PARK LEK II. Under this heading, Marabouparken Konsthall initiates long-term local collaborative projects that link artists, people and the city’s common spaces and enable creativity and experience from different sources in an interesting dialogue about the shaping of the society in which we live. Marabouparken Lab., as indicated by its name, focuses on experimental projects, which are open-ended and explorative and are realised both in and outside of the gallery. Kerstin Bergendal is a Swedish artist (b. 1957) who has long been based in Copenhagen where she is well-known for her large-scale public interventions and participatory projects. She was one of the founders of the artist-run platform TAPKO, 1991–2005. She was responsible for the transformation of the Overgaden Institute for Contemporary Art in Copenhagen 1996–2002. In Roskilde she ran an art programme for eleven years in relation to the local authority’s development of a new district (the Trekroner Art Plan). In May 2012 a new type of public space will be inaugurated in Trekroner, developed together with the residents in the area – “En Ny Fælled til Trekroner”. Kerstin Bergendal has also served on the committee of the Danish Agency for Culture Fund.